Meg suggests a plan to unmask Joan; Steve offers Bea parole help on certain conditions. I have corrected the misspelling Anna "Lizza" (!) Meg explains to Erica that she thinks they should play Joan at her own game: if she pretends to be involved in corrupt activities herself, Joan would inevitably be drawn to collude with her. Erica reminds her that as someone who has just served a prison sentence on a matter of principle, she would hardly be the most likely candidate to appear to be corrupt, and tells Meg that she could not agree to any such plan unless the details were better thought out. The women are surprised to see Lizzie brought back to the laundry, but Lizzie says she'll get another chance at parole. Bea challenges Joan when she tries to take away Maxine's buyup for a cheeky remark, and Joan has to content herself with sneering at Maxine's mother's disappointment in her at her visit. Tony brings a couple of new residents to the halfway house, prostitutes Trixie and Francine : they immediately complain that there's no television. Steve offers to arrange work release for Bea before her parole hearing: Bea rightly suspects that she must be expected to do something in return. Later on, Bea tells Faye to warn her when she next makes a killing on the book. An old woman arrives at the halfway house with her cage birds looking for a room. Bea finds out that Faye has enough money to give Joan a cut of the profits. Steve catches Faye doing her accounts but rather than confiscate the take, he takes a cut for himself. When Faye tries to protest later on that Steve has taken her money, none of the women believe her, but Bea takes the money Faye was saving as Joan's cut just as she is about to pay up. Joan slaps Faye around until Faye tells her to ask Steve if she doesn't believe her story. Trixie and Francine complain to Tony about the noise made by Beryl's birds. At morning muster, Maxine is told she's leaving as her father has paid her fine, but in reception she finds he did not stay long enough to see her. Joan notices that Barbara isn't on laundry duty as allocated: the women tell her Barbara has been allowed to work in reception and hint to Joan that she must have done Steve some favour or other... Meanwhile, Neil is taking Chrissie off the cleaning duties that Joan gave her and Tina as a punishment so he can have a chat with her in the surgery. Joan notices another absentee and storms off to the infirmary, nearly catching Chrissie and Neil about to engage in a bit of discreet snogging. Joan tells Neil she doesn't give a damn if he wants to screw around with sluts, but she won't put up with anyone who undermines her orders. Margo upsets Paddy and she refuses to see Dr Weissman. Tony visits Wentworth to see Tina to try to get her to come to the halfway house after her release. Dr Weissman tricks Paddy into seeing him in the garden as a visitor, and persuades her to resume her treatment. Meg pushes Margo up against a wall and orders her to stay away from Paddy. 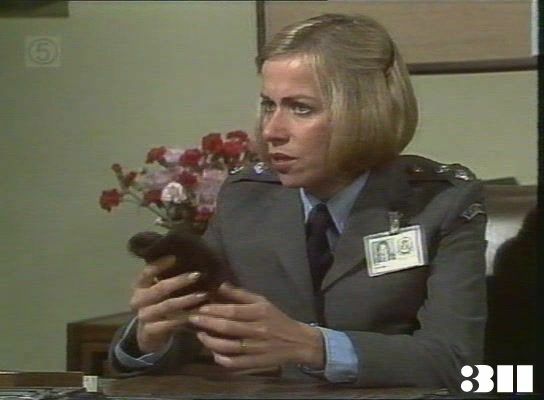 Joan catches Bea in Helen's cell helping her to pack up and picks on Helen, forcing her to apologise or face a charge and lose her release that day. After Joan has sent Helen to reception, Bea tells Joan that all the women call her "The Freak": from her reaction she appears not to know this already, and she retaliates by telling Bea she regards her as her own "special project". Tina and Helen are released as Joan and Neil leave work. After going out for a meal to celebrate, Helen and Tina split up: Helen goes home but Tina goes back on the streets where she is attacked and killed by the black gloved killer . Joan makes snide remarks to Colleen about Steve "helping" the women, and hints at a financial motive for his interest. Det Thorne arrives to interview the women about Tina's murder, and shows Colleen a black glove found by Tina's body . She identifies it as Joan's from the initials "JF" inside.